Register by December 3 to obtain the early bird discount ($825 for members, $1,055 for non-members). Book a hotel ASAP if you haven’t already. Rooms are available at several close-in hotels at reasonable rates. Or, do as I always do and rent a house or condo through Airbnb or VRBO and then just take Uber or Lyft to the convention center. Do not reply to the shady non-HIMSS emails offering rooms – they’re a scam since HIMSS controls basically every hotel room you’re likely to want. Note the odd dates – the opening reception is Monday evening (February 11), the opening keynote is Tuesday morning, and the conference ends after a partial day on Friday (that’s going to be a slow conference day for sure). The exhibit hall will be open Tuesday morning and will close Thursday evening. The online educational agenda is incomplete, with many sessions containing only a placeholder without presenter names (seems a bit late to still be working on that, but it’s not going to change anyone’s plans either way). All keynote speakers announced so far work in for-profit companies – Atul Gawande, MD (of the ABC consortium that hasn’t named itself yet), Susan DeVore (Premier), and Mick Ebeling (Not Impossible Labs). 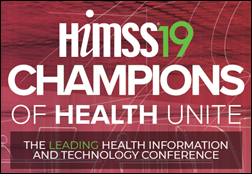 Many of the educational sessions have vendor presenters, quite different from the HIMSS conferences a few years back where the commercial side of health IT was kept separate from the education sessions. The theme of the conference is the rather dopey “Champions of Health Unite,” perhaps a stretch given that most of the attendees are vendors or IT-related people whose scope and influence in “health” is tiny (we contribute slightly to the work of providers, whose services in turn contribute about 20 percent of a person’s overall health). HIMSS, as usual, proclaims itself an equal partner as we advance information and technology “to meet our biggest challenges head-on and truly transform health,” which you would think would have been accomplished by now since they claim impending “transformation” every year and the US healthcare system is a bigger mess than it’s ever been. 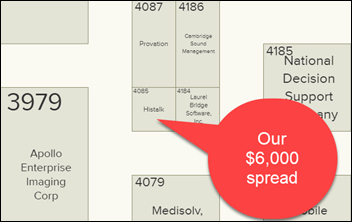 Our tiny 10×10 booth is #4085. The location is OK (especially since we’re not selling anything) and several of our neighbors are HIStalk sponsors, which is often fun. We’re near the restrooms, of course, since that’s always the case except that one year we were nearly co-located with the Thai food kiosk. Many small booths remain available. I wouldn’t wait long to get on board, though, since latecomers aren’t listed in the printed guide. I’m always skeptical about companies that aren’t organized enough to sign up given a full year’s notice, especially if they’re pitching project management services. Exhibiting isn’t cheap. Non-member booth space costs $45 to $47 per square foot plus $725 for a corner. 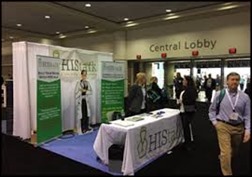 HIMSS provides five exhibitor or client badges for each 100 square feet purchased, which makes it a better deal for us even though we only use a couple of those badges. The 10th and final HIStalkapalooza was in 2017, so there’s no need to email me asking for tickets (I still get those requests regularly). You can watch the video of the 10th and final one at HIMSS17 in Orlando if you’re feeling nostalgic. Exhibitors get priority choice for booth space given their HIMSS Exhibitor Priority Points, earned by spending a lot on HIMSS stuff (including participating in other HIMSS-owned conferences and throwing down major advertising dollars to its HIMSS Media PR factory). You might want to review these reader-provided tips if you’re a first-time attendee. 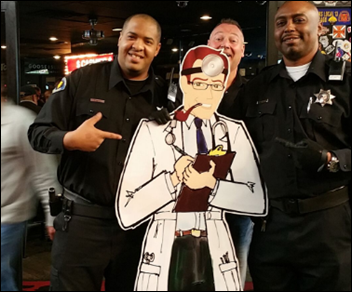 Having interesting characters and pseudo-celebrities hang out in our little booth. Let us know if you want to participate – my definition of celebrity-hood leans toward the offbeat. Talking up HIStalk sponsors a bit beforehand to let folks know what they’re doing there. We will be too busy after January 1 to get new sponsors on board until after the conference since it’s just 41 days between New Year’s Day and the conference’s start. Giving away stuff in our booth, which ranges from the slightly cool but obviously cheap (when I have to pay for it) or nicer, vendor-supplied swag that is higher quality but potentially less cool. Cruising the exhibit hall to write up what we see — the buzz, giveaways, demos, and booth people behaving badly (see my exhibitor tips to avoid being called out, and for God’s sake don’t dress non-clinicians in scrubs). Covering the 5 percent of vendor announcements (most of them unwisely pushed out Monday amidst the mayhem) that contain something even mildly interesting. Maybe having some kind of DonorsChoose fundraising event if I can figure something out. Posting the HISsies results. Which reminds me that I need to get the voting underway soon given the early conference date.